Use Econblox' tools to reduce student textbook costs, and improve student outcomes with your own customized content and professionally-produced animations. It's easy. Profs invest only their time and expertise. Many college textbooks deliver a fire hydrant of information that can overwhelm students and make it expensive or difficult for a professor to select only relevant readings for the course. ​Both publisher textbooks and their digital counterparts remain very expensive for students. Even worse. Many students don't buy the assigned publisher content because it's too expensive. This is bad for the student, the professor, and the school. One solution is to change to a free open-source textbook like the ones from OpenStax. But it takes time and expertise to transition from a major publisher's expensive textbook or digital platform to more affordable study-packs or to a free, open-source textbook like OpenStax. Re-organizing course content, improving it, and adding the videos that students love, takes time. Combine your content with a video selection from our 290+ broadcast-quality, professionally-produced short videos that best meets your instructional goals . More than 65% of students learn visually yet few instructors use professional animations. With your selected content and our videos, students can save plenty. 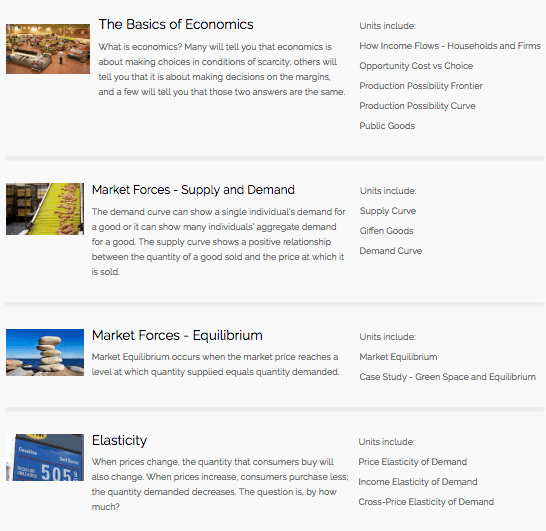 These superior digital materials can be offered at half the price that students pay for traditional introductory economics content. OpenStax textbooks are a great way to start. It takes extra work for you to evaluate, select and compile this content. It's worth it though. Be paid for the time that you invest in creating digital content that saves students money and delivers better outcomes. Students will thank you for supplying engaging video that lets them use their phones to learn. Students can watch these short economics videos and animations anywhere, anytime. Instructors spend less time repeating the basics. We need to do more for disabled students. Econblox closed captioned all its videos to assist the hearing-impaired absorb video content. Closed captioning is a bonus for foreign students and students who need to study in noisy places. Beautifully presented short animations concentrate on the key economics concepts. Combined with your content, students can achieve that aha moment. Professors can precisely focus their content on the course learning objectives. Econblox makes it easy for economics professors to be fairly paid for the extra work they do to improve the student experience. And we make it easy for professors to take students' digital learning tools to the next level using our professionally-produced, closed-captioned, HD videos and animations. Did you know that more than 65% of people learn visually? Yet, few professors use professional videos to systematically help their students learn. Existing video for economics courses either is not professionally-produced or is produced by one of your school's competitors. Respond to your students visual learning needs by adding Econblox videos to existing course content or to a new open-source textbook. This Natural Monopoly lecture video is just under two minutes in length and was shot in High Definition in Boston, near Fenway Park. The featured instructor is a lecturer at Northeastern University. This Opportunity Cost in International Trade video is four and a half minutes in length and was shot in Michigan's Upper Peninsula. The featured instructor is a lecturer at Northern Michigan University. This Natural Monopoly key concept video is 37 seconds in length and was produced in Montreal. Animations are short and simple for high school students. This short GDP Deflator vs. CPI video helps students understand the difference between these two measures of price levels. What topics do the economics videos cover? Is It Ethical For A Professor to Be Paid for Work That The Professor Assigns? In fact, the American Association of University Professors states that professors should assign readings that best meet their course's instructional goals. The AAUP's position is that professors "may well conclude that what they themselves have written on a subject best realizes that purpose." It seems unlikely that a mass-produced Economics textbook that comprehensively covers many Economics topics, not covered in your course, can best meet a course's instructional goals or student needs. Most schools expect professors to be paid for work outside their contract. Some schools' policies require professors to choose between contributing profits to a scholarship or library fund whatever profits are realized from the sale of materials to their own students. Some require that the materials be approved by a department committee or chair. Do what's right for you, your students, and your school. You can be compensated for your extra efforts or donate profits to your department or school. If you move to another school, you should be able to take your own content with you. "The films have a fast tempo that respond to students' attention spans and will help many tremendously. The animations are clear, sleek and understandable." "The videos are very concise and to the point...the application of real world examples makes them very easy to follow ... perfect length." "What you have done is unbelievably great." "I think this effort is outstanding and I'm recommending it to my students." "These guys demonstrated time and time again, their understanding of what it takes to create truly successful and engaging educational videos." These are the only professional economics videos built for white label delivery. Most of your students learn visually. Respond to their needs with professionally-produced HD videos. We'll help you set up the videos on your school's digital platform. Track student progress. Instructors save time in class. Better student outcomes. Animations are distilled into the essentials. Students use the interactive multiple choice questions to check their understanding. All videos are closed-captioned, responding to hearing-impaired students' needs and mobile video. Build the course that you always wanted! Like What You See? Book A Demo Now! These videos will work on any digital platform that can play videos. We've tested them on all major LMS and content platforms. We'll help your school set them up. The videos can also be delivered in SCORM files so students can improve their performance, using any system or device! Try the Natural Monopoly SCORM demo and video set below:. So, why not combine a free textbook or your own work with paid digital videos, interactive questions, and study notes to improve the student learning experience and reduce the price that students pay for content? You don't need to write an open-source Economics book for your students. It already exists. Use the best of open-source and reasonably-priced paid content to deliver the highest quality, most focused content to your students - AND save students money. One publisher calculated that Harvard's Greg Mankiw has received more than $42 million in royalties from one Economics book alone. What's wrong with that? "Let me fix that for you: Would you keep doing your job if you stopped being paid? Why or why not?" We think Professor Mankiw got it right. Professors should be paid for the work they do. Professors should also be paid for the extra work they do. $42 million is much more than the few thousand dollars you'll regularly earn for the work that you invest into your own course content. More importantly, you'll get the satisfaction of delivering students focused digital learning content and videos that save them money. Watch this video to see how the SCORM content works on one Learning Management System. Each learning unit is easy for students to navigate, view videos, and test their knowledge with responsive multiple choice questions. Students easily work through the content until they get it right which means better grades and higher teacher evaluations. Since our company began, more than a decade ago, we have had the privilege of working with these great clients, and many more.